This articulated truck is motorised and features 'sonic control'. Powered by 4xAA batteries mounted in the trailer, an electric motor drives the rear trailer axle. It is controlled by a hand-held 'clicker', the sound of which is picked up by a microphone in the top of the trailer. One click makes the truck move forward, a second click makes it reverse and turn, and a third click stops it. The tractor and trailer both have orange diecast chassis. The cab is white with black bumper, orange roof aerofoil and amber tinted windows. The trailer has a choice of two clip-on bodies: a container-type body with 'Yorkie' labels or a tanker body with Gulf labels. 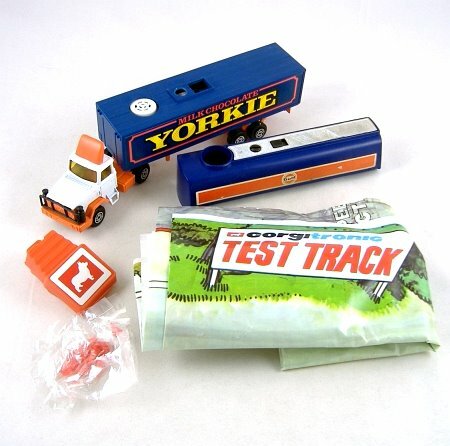 The set comes with a bag of 16 traffic cones and a 'test track' play mat. This example is in full working order and is complete with test track and unopened bag of cones. There are a few small paint chips and some degradation of the 'Gulf' labels, and the plastic retaining latch is missing from the top of the 'Yorkie' body. The box is complete with inner but is very 'tired' and has some tape repairs.